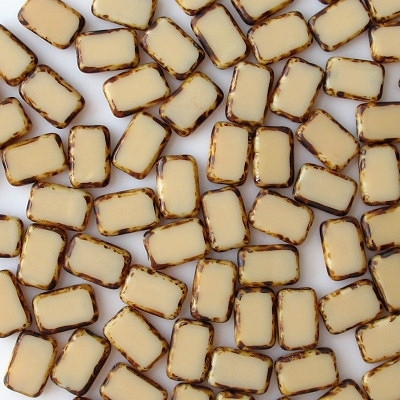 12mm (long) x 8mm (wide) polished rectangles, about 3.5mm thick. Beige with a dark brown picasso coating around the edges. I eliminate seriously defective beads before shipping. 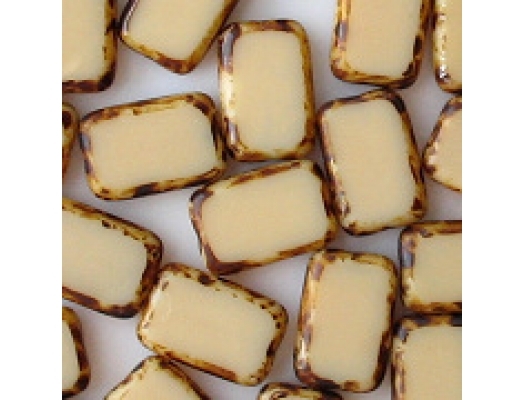 That includes beads with cracks, deep or long scratches, partially polished windows, large pits, and large spots of picasso coating on the windows. However, I don't count very small pits, small nicks, very shallow scratches that are hard to see, or small spots of picasso coating on the windows as defects. If you receive any beads with serious defects, that means that I overlooked them, and you should contact me for a partial refund. IMPORTANT: Beginning in October, 2014, I switched to beads from a different supplier (supplier E instead of supplier C). 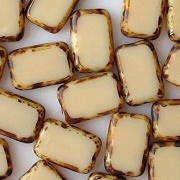 The beads from supplier E are thicker than the ones pictured, and they have sides which are more curved, and the picasso coating is darker and covers more of the bead than with the previous batch. Personally, I like these new beads better than the ones pictured.